Pesarattu | Vegan and Gluten free Lentil Crepes are light and delicious option for breakfast or a light meal. Pack these in lunch boxes as well as they are very filling as they are made with mixed lentils. They are a delicacy in Andhra Pradesh, often served with coconut chutney. 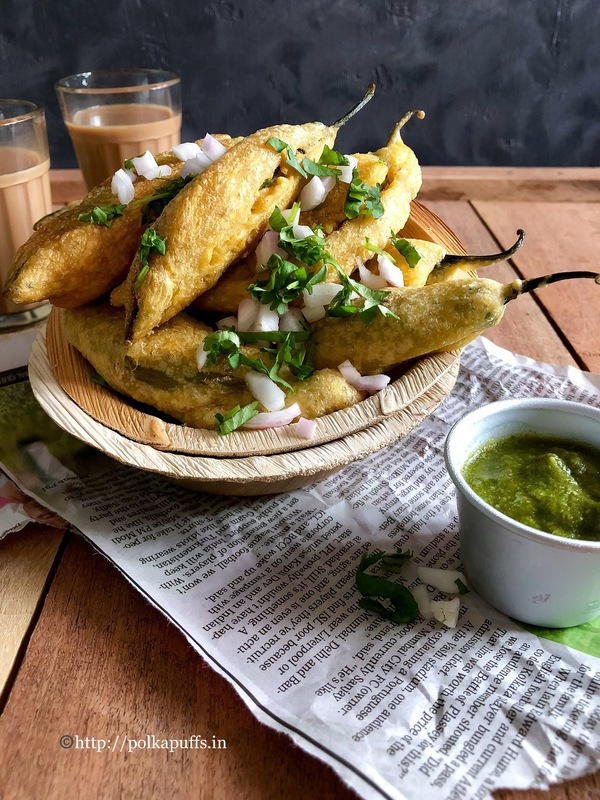 Pesarattu | Vegan and Gluten free Lentil Crepes are very crispy owing to the different lentils added. 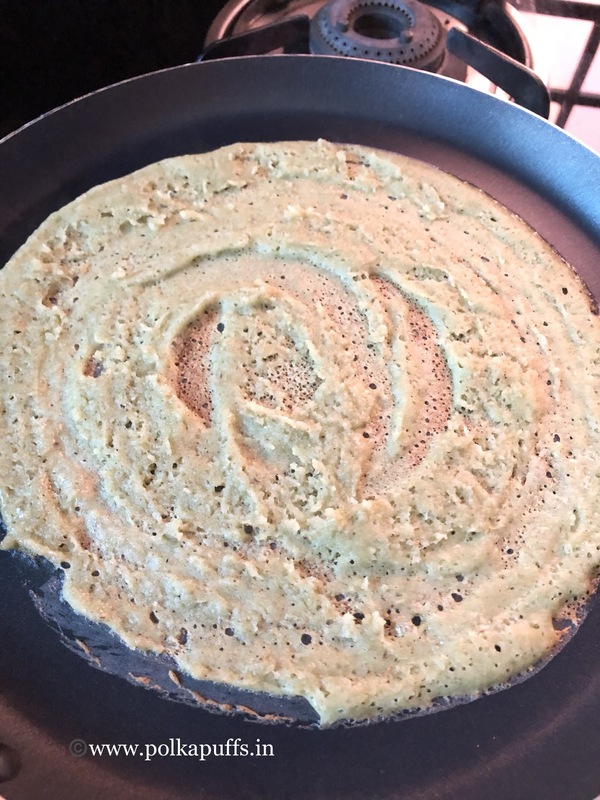 They have a really nice taste since the lentils have very distinct flavors and when ground together, so these crepes turn too yummy! The best part here is that the batter for the Pesarattu or crepes does not need to be fermented. Just soak the lentils for 4-5 hours and grind them to a smooth paste. 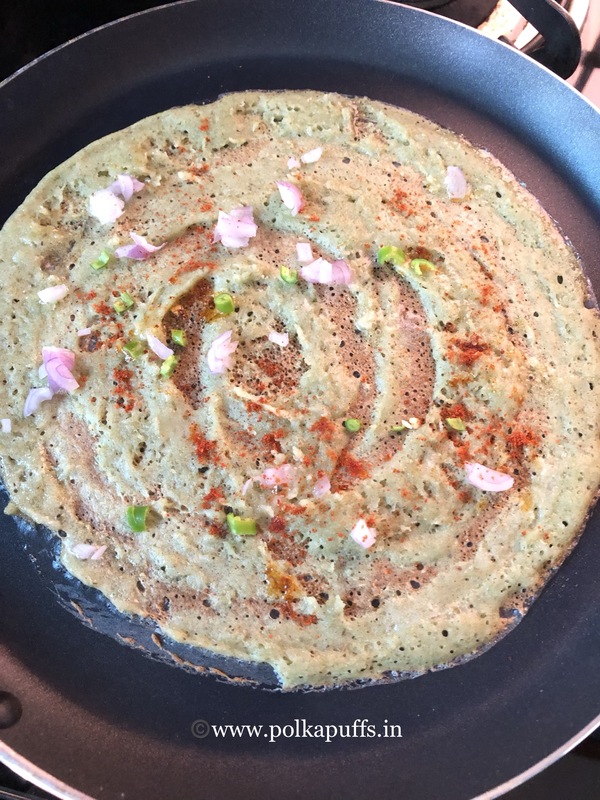 Pesarattu | Vegan and Gluten free Lentil Crepes taste lovely with any kind of dip or relish. I’ve served these with Udupi Style white coconut chutney, at times with basic green coconut chutney . They taste amazing with some red tomato onion chutney as well. 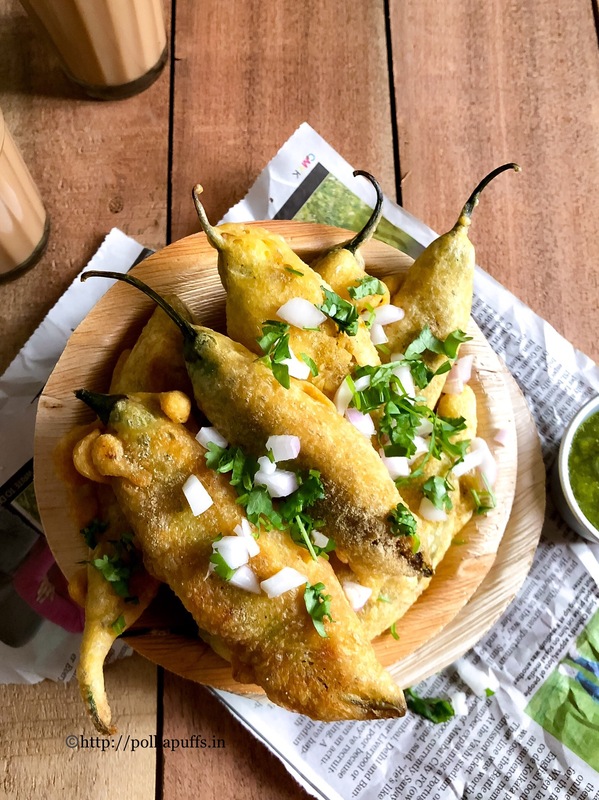 Try pairing these with Tiffin Sambhar (instant Veggie and lentil stew). 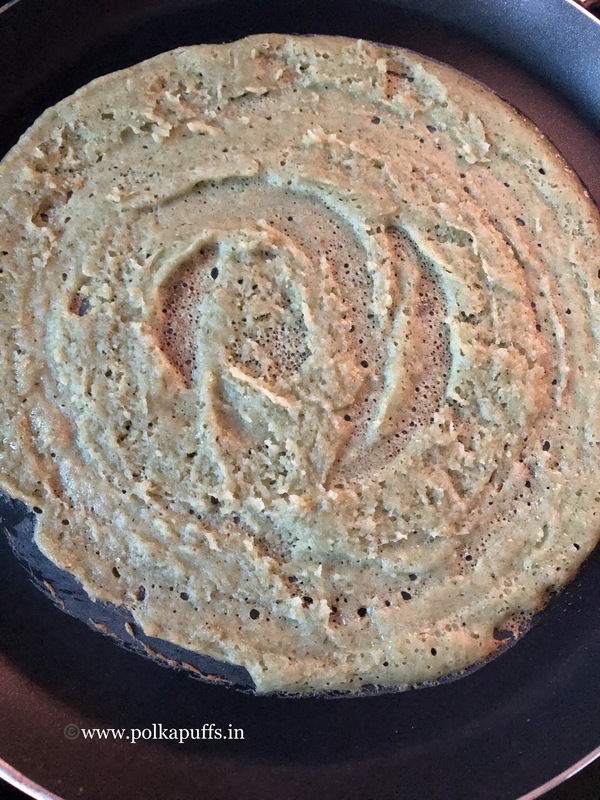 The batter made for Pesarattu | Vegan and Gluten free Lentil Crepes can be stored in the refrigerator for up to 3-4 days. The batter stays fresh and doesn’t thicken over a period of time. So it is perfect for meal planning as well. Keep the batter ready along with some of the chutneys. It will sort your weekday worries for breakfast or lunch box. 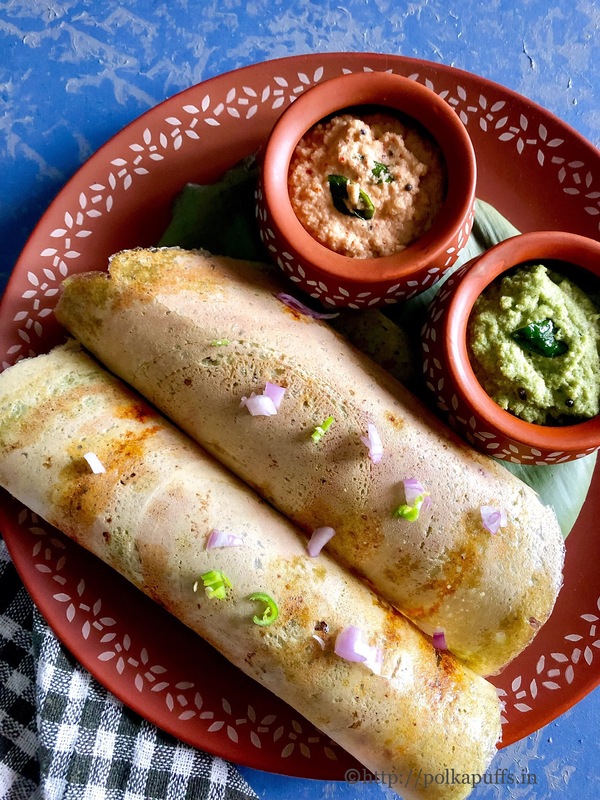 Let us make some Andhra Pradesh/ Telangana state special breakfast Pesarattu | Vegan and Gluten free Lentil Crepes! Wash and soak the rice and lentils together for 4-5 hours. Drain the water after 4-5 hours. Grind these together with ginger, fresh coriander leaves green chilies, cumin seeds and very little water. The batter should be smooth without any lumps. Then season it with salt and mix well. Keep the batter aside for just 10-15 minutes while you prep the onions, etc. Heat the griddle/ tawa. Pour a few drops of oil and wipe it off with some damp kitchen paper. The griddle/ tawa will sizzle, that means it is ready for making Pesarattu/ crepes. Pour a ladleful of the batter on the griddle/ tawa and spread it really well. Scrap off any extra batter on the top. Cover with a lid and cook on low flame for 4-5 minutes. Then open the lid and pour a few drops of oil (optional). Then sprinkle red chili powder, some chopped onion, chopped green chilies and a bit of lemon juice. Do not flip the Pesarattu/ crepe. Just fold and serve piping hot. I have served with Green coconut chutney and pink coconut chutney. Grind together grated coconut, dry red chilies, tamarind pulp, salt and some water to make a smooth paste. Heat oil in a small wok, add curry leaves, mustard seeds and some asafoetida. Once these splutter together, add the tempering to the ground chutney/ relish. Mix it well and serve. This chutney/ relish keeps well in the refrigerator for 2 days. Heat oil in a small wok, add curry leaves, mustard seeds and some asafoetida. Once these splutter together, add the tempering to the ground chutney/ relish. Mix it well and serve. This chutney/ relish keeps well in the refrigerator for 2 days. Some recipes are so satisfying that you wish to make them again and again. 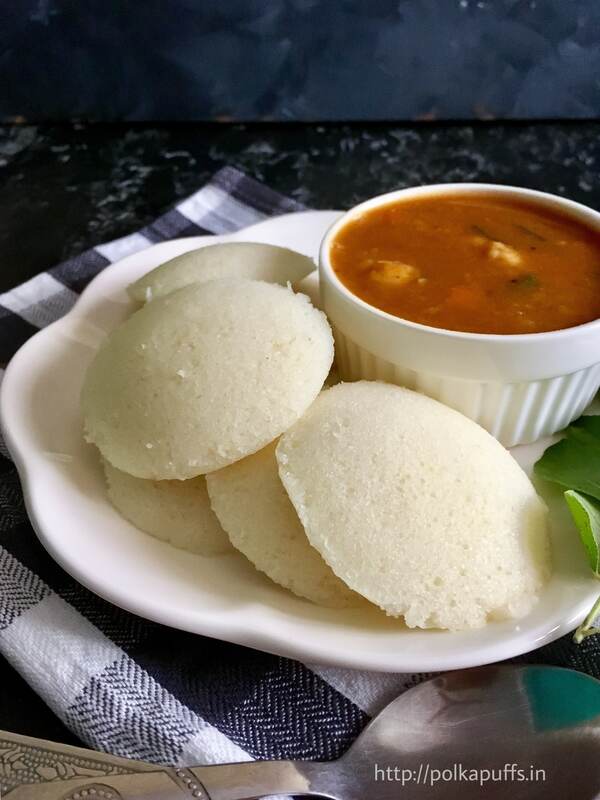 Rava Idli Recipe | Instant Rava Idli Recipe is one such breakfast option for us. Easy to make and needs barely 30 minutes of prepping. These Rava Idlis are soft, fluffy and very delicious 🙂 I usually pair this with Sambhar and sometimes with coconut chutney (all 3 of them are my Mom’s recipe). I can live on them! 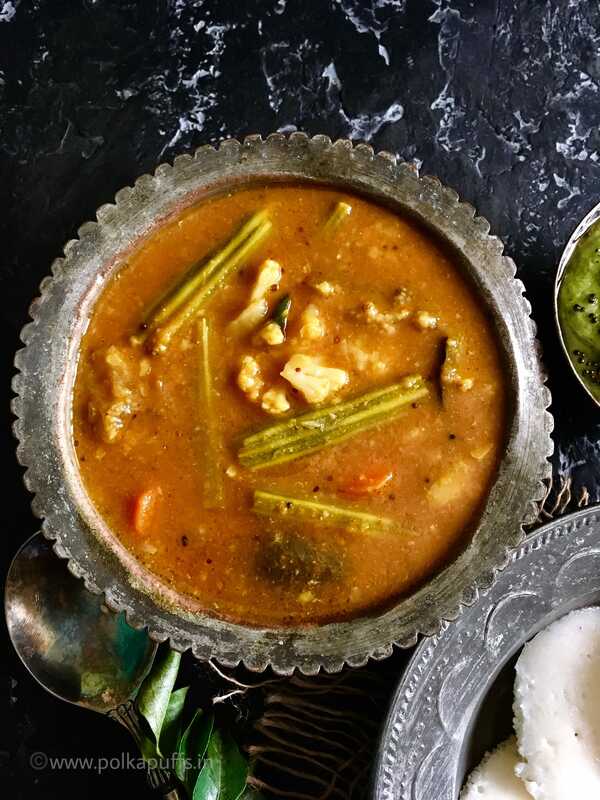 The Sambhar is also an instant recipe. All one has to do is pressure cook everything! Yes, it’s a kind of a tiffin Sambhar. The chutney, now that’s something which is so delicious, it’s a no brainer and take 10 minutes!! An entire breakfast spread in an hour, tops! Weekend goals??! Sorted! Yes, I like a ton of curry leaves in my South Indian cooking. And rightly so! It adds such a depth of flavor and a ton of earthiness. I love it 🙂 Oh and yes, the little veggies that you see floating in my Sambhar are small florets of cauliflower, small carrot sticks and some French beans. You can add pumpkin, ash gourd or even some brinjals if you wish to add more veggies. Coming to the Rava Idli recipe, it’s basically really simple. But as every simple recipe out there, this one too needs a bit of focus. The proportion is everything! 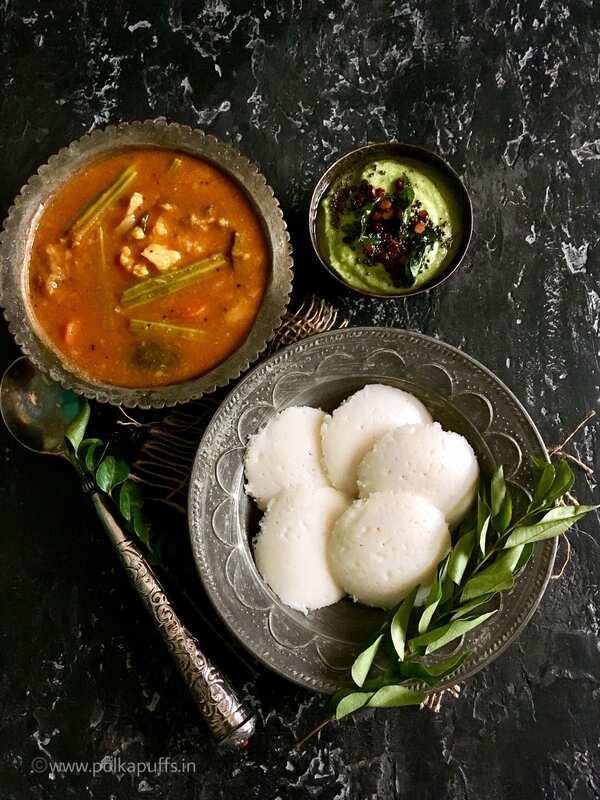 Mess that and you’ll not get these beautiful white Rava idlis. We will start with the recipe for the Idli. First, we will dry roast the Rava/ semolina for 3-5 minutes. Ensure that the flame is on a low setting. The color of the Rava/ semolina must not change. Next, add curd and salt to the toasted Rava/ semolina. Mix well. Add water and eno fruit salt. Cover the bowl and let the batter rest for 30 minutes. 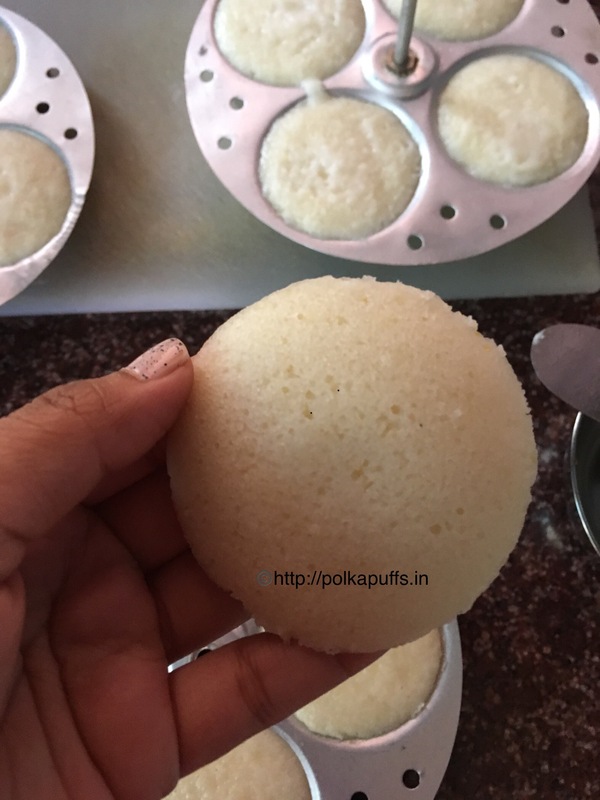 Pour the batter into Idli plates and place in the Idli cooker which has an inch of water boiling at its base. Steam the idlis for 12-15 minutes on medium flame. Wash and soak the dal for 30 minutes. Add the soaked dal in the pressure cooker with water, salt, turmeric powder. Add the tomatoes, curry leaves, onions & bottle gourd too. Cook them together in the pressure for 2-3 whistles. Let the pressure cooker cool down completely before opening the lid. The dal & the veggies must be soft & mushy by now. You can add some water to correct the consistency if needed and boil the dal for about 2-3 minutes. Next, add sambhar powder and grated jaggery to the tamarind pulp and mix well. Add this mixture to the cooked dal & veggies. Stir well and boil the sambhar for 3-4 minutes. Now to temper the sambhar, heat oil in a small pan. Add all the ingredients listed above ‘for tempering’ to the hot oil and let them splatter for about 2 minutes. Add this tempering to the boiled sambhar and mix well. Cover with a lid for a few minutes. Serve piping hot with Idli/ Dosa/ boiled rice. 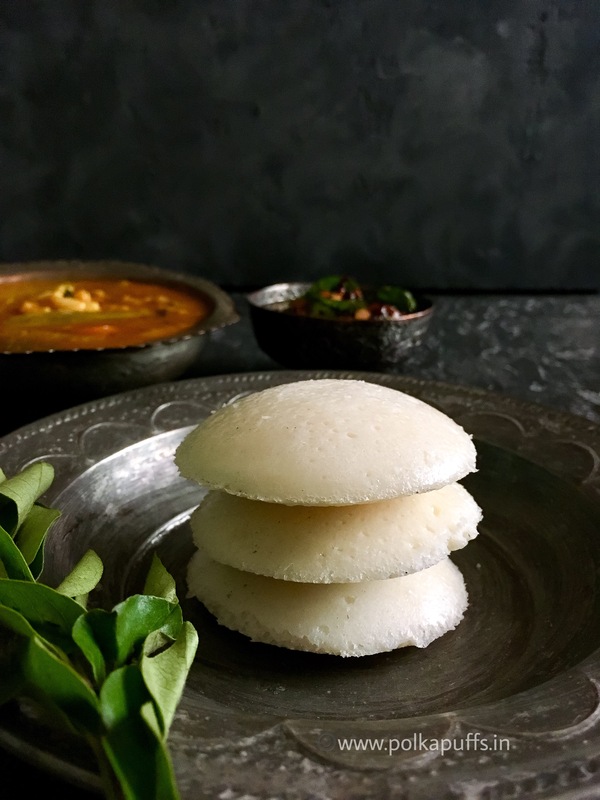 Rava Idli - A light, quick and delicious take on South Indian favorite, steamed rice and lentil cakes makes for ideal breakfast or a complete meal. First, we will dry roast the Rava/ semolina for 3-5 minutes. Ensure that the flame is on a low setting. Once the idlis have steamed, remove the plates from the cooker. Let them cool for a couple of minutes before removing the idlis from their cavity. Serve with Sambhar and Chutney. Heat oil in a small pan. Add all the ingredients listed above 'for tempering' to the hot oil and let them splatter for about 2 minutes. Proportions are key, so follow the recipe correctly. Do not store the batter in the refrigerator as it gives the best results when fresh. 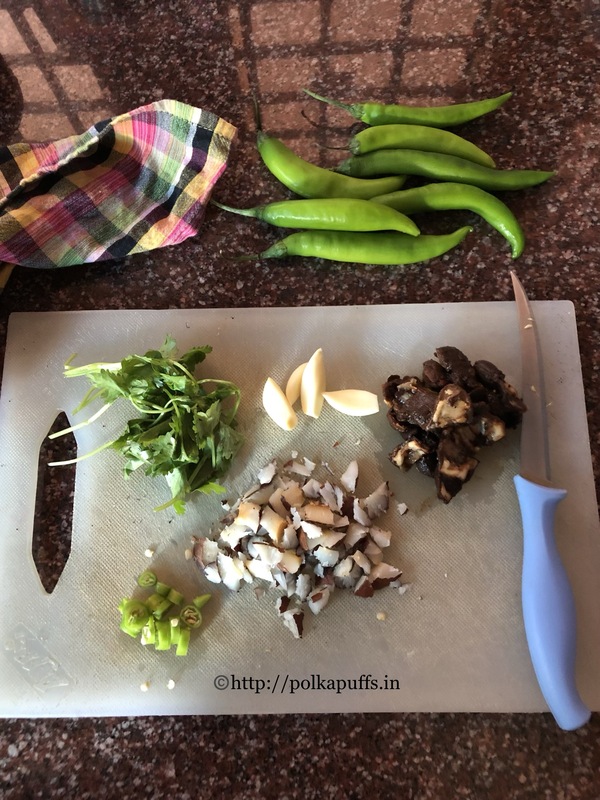 We rarely make South Indian food at home…my hubby ain’t too fond of it and I can’t just make it for myself even though I love it too much! 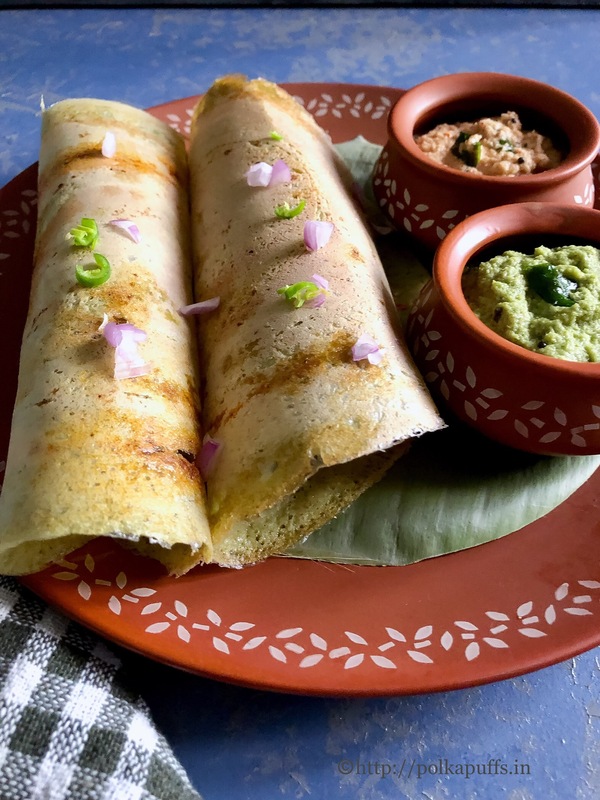 But then there are days when he happily agrees to his one and only favourite from the cuisine – Onion Rawa Masala Dosa with spicy, tangy Sambhar…he isn’t too keen on coconut chutney…so I happily skip that! 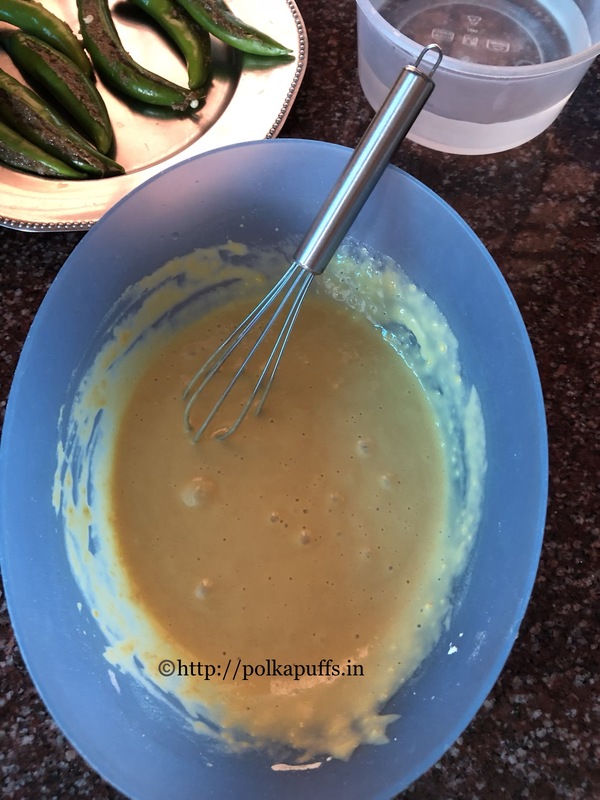 Last year I had shared the recipe for plain Rawa Dosa, now you’d think, what’s the difference…we simply need to add the potato masala and that’s it. No, there is a difference, at least in the way I make it. The batter is different which ensures more crisp dosas that can hold the Masala well without becoming soggy and heavy. The batter which I make for onion Rawa Masala Dosa is different in terms of the proportions of the ingredients used. 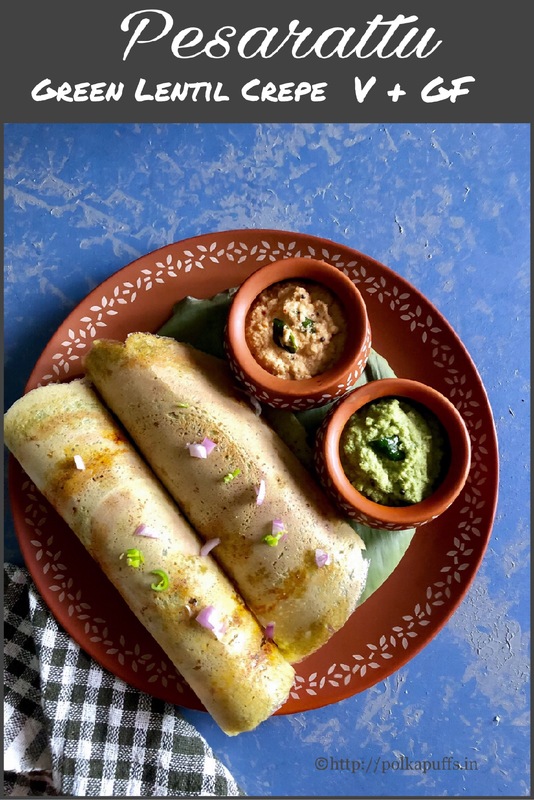 If you follow the recipe properly, you will get crisp, lacy and crunchy Rawa Dosa. Let’s learn how, do follow the steps properly, it’s very simple. Equipment: a non stick pan, a spatula, measuring cups/ spoons, a mixing bowl, a ladle. Take all the dry ingredients in the bowl, stir them well. Then add water and make a runny batter (the batter must not too runny but not thick at all). Let it sit for 5-7 mins. Equipment: a wok, measuring spoons/ cups, a spatula. Heat oil n the wok. Once it’s hot, add mustard seeds, hing. Let these splatter. Then add ginger-garlic paste, curry leaves and chopped green chillies. Cook them for 2-3 minutes. Then add the onions. Cook these till they turn slightly pink. Add salt and turmeric at this stage. Mix well and add the potatoes. Ash some of the potatoes as they cook. Ensure everything is mixed well. Turn off the flame. Stuff this Masala within the Dosas and serve piping hot! P.S. you can add green peas and tomatoes too in the Masala but I don’t prefer their flavour in the Masala for Dosa. Equipment: a pressure cooker, a small pan, measuring cups/ spoons, a ladle. Wash and soak the dal for 30 mins. Add the soaked dal in the pressure cooker with water, salt, turmeric pwd. Add the tomatoes, curry leaves, onions & bottle gourd too. Cook them together in the pressure for 2-3 whistles. Let the pressure cooker cool down completely before opening the lid. The dal & the veggies must be soft & mushy by now. You can add some water to correct the consistency if needed and boil the dal for about 2-3 mins. Next, add sambhar pwd and grated jaggery to the tamarind pulp and mix well. Add this mixture to the cooked dal & veggies. Stir well and boil the sambhar for 3-4 mins. Now to temper the sambhar, heat oil in a small pan. Add all the ingredients listed above ‘for tempering’ to the hot oil and let them splatter for about 2 mins. Add this tempering to the boiled sambhar and mix well. Cover with a lid for a few mins. Serve piping hot with Idli/ Dosa/ boiled rice. Sharing the recipe for healthy and nutritious Adai with Tomato Onion Chutney today. Breakfasts are an important meal in our home, something fresh, filling and delicious is a must. But for me it’s more important to serve a healthy breakfast for my hubby and myself. We particularly do not enjoy a bread and butter kind of breakfast on a regular basis. We have similar preferences when it comes to food…and like to have something warm for breakfast and definitely not out of a box! 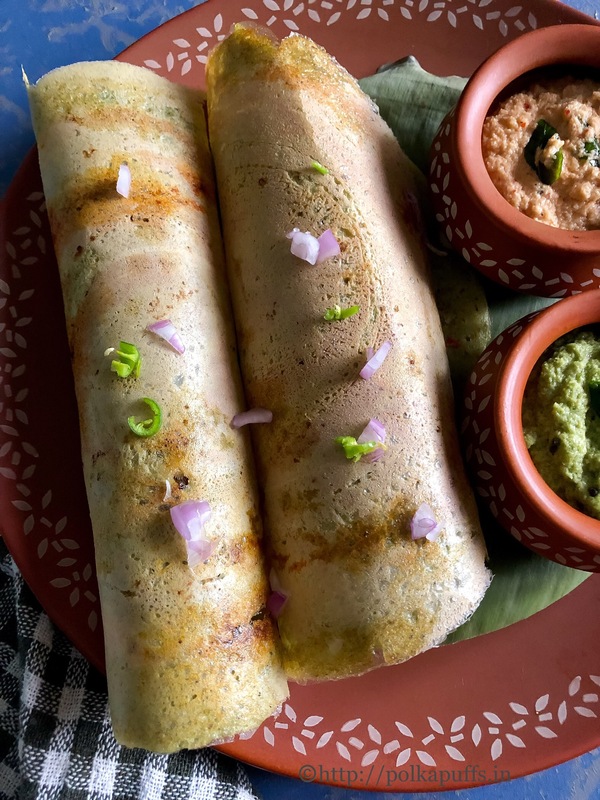 Today, I am sharing the recipe of Adai (mixed lentil dosa), a popular breakfast variety in South Indian Cuisine which is gluten free and vegan too. 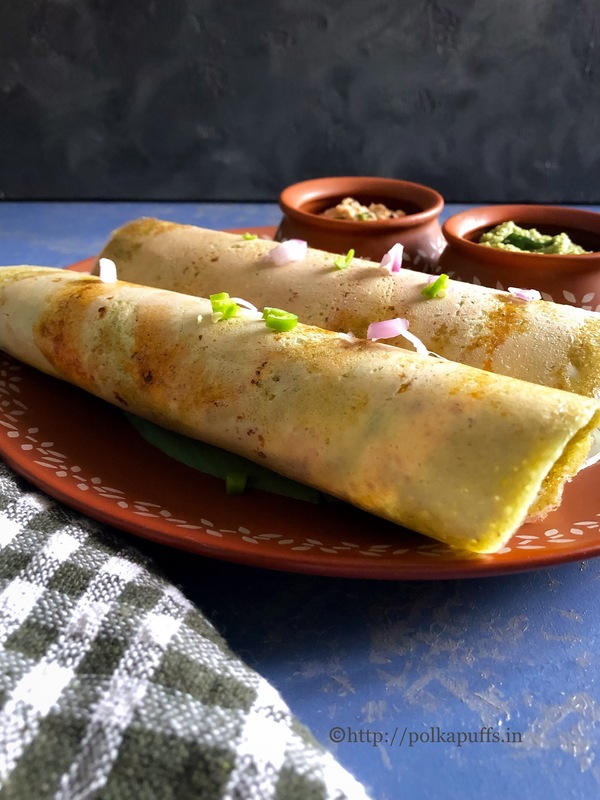 These crepes or Adai are very crisp and flavoursome as opposed to a plain dosa (South Indian crepe). They are very healthy as they are made using various lentils along with rice and some more spices. The best part about making Adai is that, one need not have to spend hours prepping it. It can made in about under 4 hours from start to finish. However, as I make it for breakfast, I keep the batter ready the previous night itself and that does make the batter more workable and the end results are always very good. 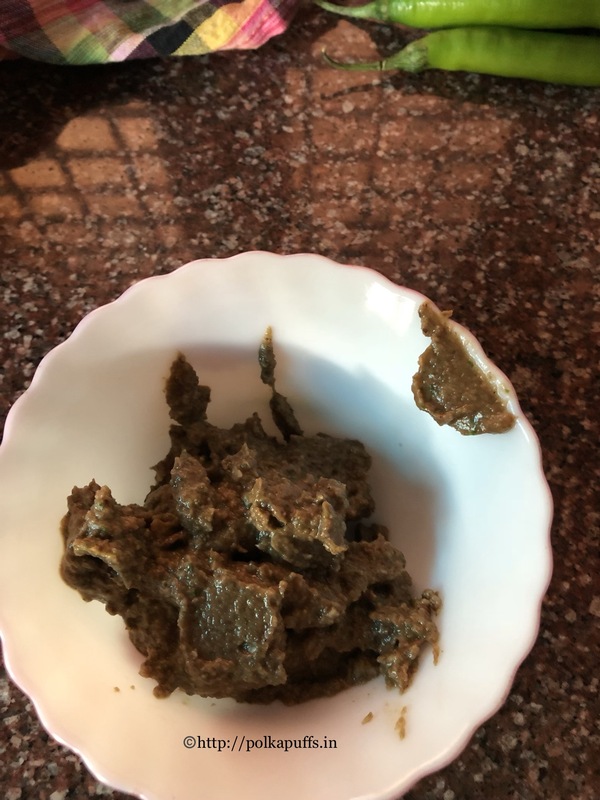 But that is not important, you can soak everything together for about 2 hours, grind and start making the Adai immediately without giving the batter any time to ferment. See the texture, it is so crisp as the ratio that have kept has more rice as compared to the lentils! 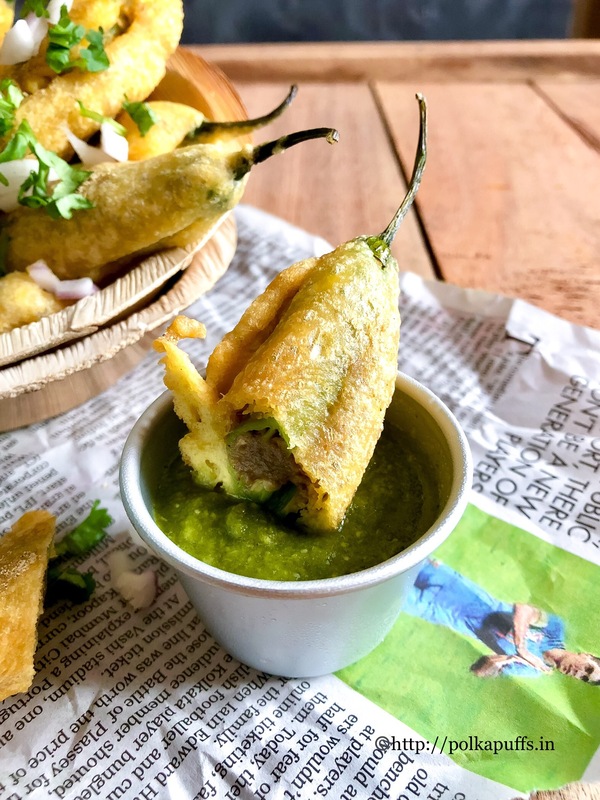 I have always enjoyed them even as a kid when my Mom would make these on weekends….a welcome change from our typical North Indian fare I’d say! 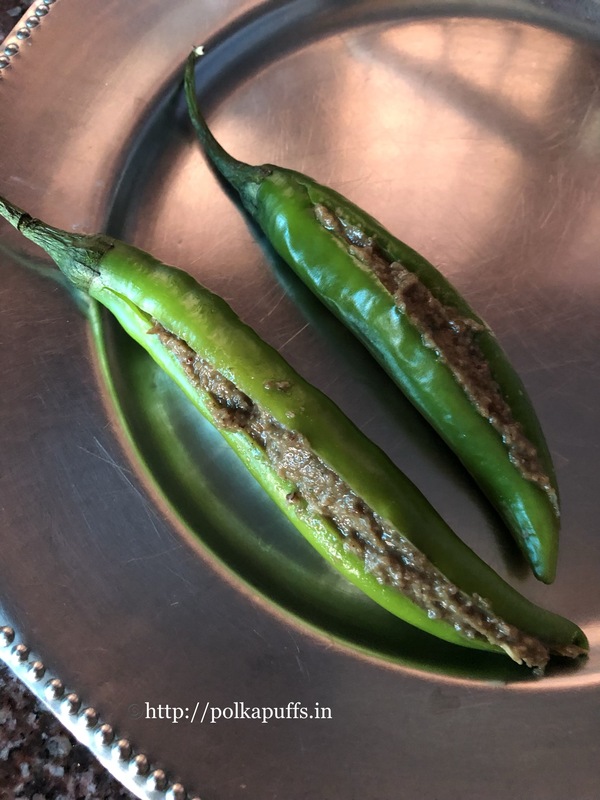 That still holds true in my home, making these on weekends is very convenient and makes for a yummy brunch….along with the spicy tomato onion chutney (my take on this popular dip from the South Indian Cuisine). 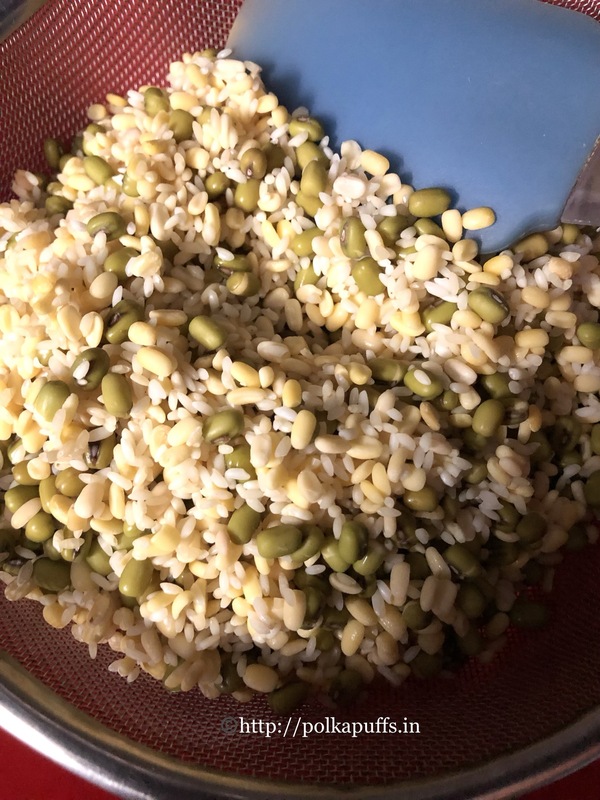 These are packed with protein and that keeps you full for a long time..it’s a complete meal in itself as it has rice and lentils. Pack these for your kids lunch boxes too! Wash the rice and the lentils together. Soak them together in 3-4 cups of water for two or three hours at room temperature. In the same bowl, along with the lentils and rice, also soak the red chillies, curry leaves and peppercorns too. Once these have soaked well for two-three hours, grind them to a smooth paste with salt, jeera and ginger using about 1/2 cup of water. Adjust the consistency of the batter with more water if required. (The consistency of the batter needs to a little thinner in comparison to that of a a regular dosa batter). Also, adjust the seasoning now. Remove the batter in a bowl, cover it and set it aside for 5 mins before making the Adai. Now heat a dosa pan, once hot enough, spread some oil and wipe it off with a kitchen tissue paper. Pour a ladleful of the batter onto the hot pan. Drizzle some oil around the Adai and let it cook on low flame for 4-5 mins. This takes a longer to cook and crisp up and colour too. Flip it over and cook for another minute or two. That’s it, done and ready to serve! Heat oil in a pan, once it’s hit, turn the flame at it’s lowest setting, then add hing, sliced onions, red chillies and curry leaves. Let the onions turn translucent, then season with salt and add the tomatoes and dalia. Stir well and let the tomatoes turn mushy and the oil seperate from the mixture. Turn off the flame, let the cooked mixture cool down. The batter for Adai stays good in the refrigerator for 2 days. The Chutney stays good in the refrigerator in a glass or porcelain jar for 3-4 days if tempered. It lasts for 2 days if not tempered. A delicious breakfast recipe from South of India that is healthy and easy to make as well. Wash the rice and the lentils together. Soak them together in 3-4 cups of water for two or three hours at room temperature. In the same bowl, along with the lentils and rice, also soak the red chilies, curry leaves and peppercorns too. Once these have soaked well for two-three hours, grind them to a smooth paste with salt, cumin and ginger using about 1/2 cup of water. Adjust the consistency of the batter with more water if required. (The consistency of the batter needs to a little thinner in comparison to that of a a regular dosa batter). Also, adjust the seasoning now. Remove the batter in a bowl, cover it and set it aside for 5 mins before making the Adai. Now heat a dosa pan, once hot enough, spread some oil and wipe it off with a kitchen tissue paper. Pour a ladleful of the batter onto the hot pan. Drizzle some oil around the Adai and let it cook on low flame for 4-5 mins. This takes a longer to cook and crisp up and color too. Flip it over and cook for another minute or two. That's it, done and ready to serve! Heat oil in a pan, once it's hit, turn the flame at it's lowest setting, then add hing, sliced onions, red chilies and curry leaves. Let the onions turn translucent, then season with salt and add the tomatoes and dalia. Stir well and let the tomatoes turn mushy and the oil separate from the mixture. Turn off the flame, let the cooked mixture cool down. Then grind the mixture using very little water to make a coarse Chutney. It's ready. You can temper it if you like. I always do - this is how - heat 1 tbsp of oil in a pan, add 1/4 tsp split urad dal, 1/4 tsp mustard seeds (rai) and 5-6 nos. curry leaves into the oil and let them splatter for a minute. Turn off the flame and add it to the Chutney. Mix it well. A plate looking that healthy and fulfilling is definitely a welcome sight! 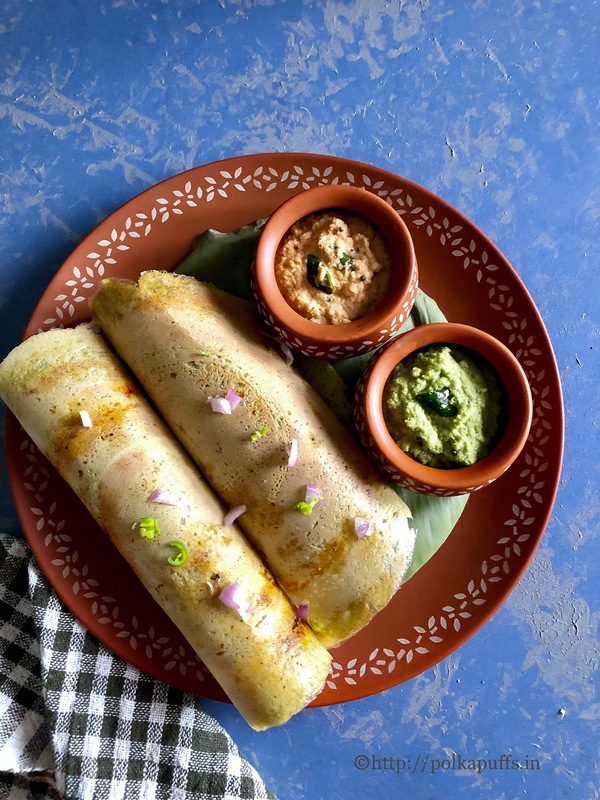 You can also try Rawa Dosa recipe (includes the recipe for green coconut Chutney). Try my recipe for Sambhar here. 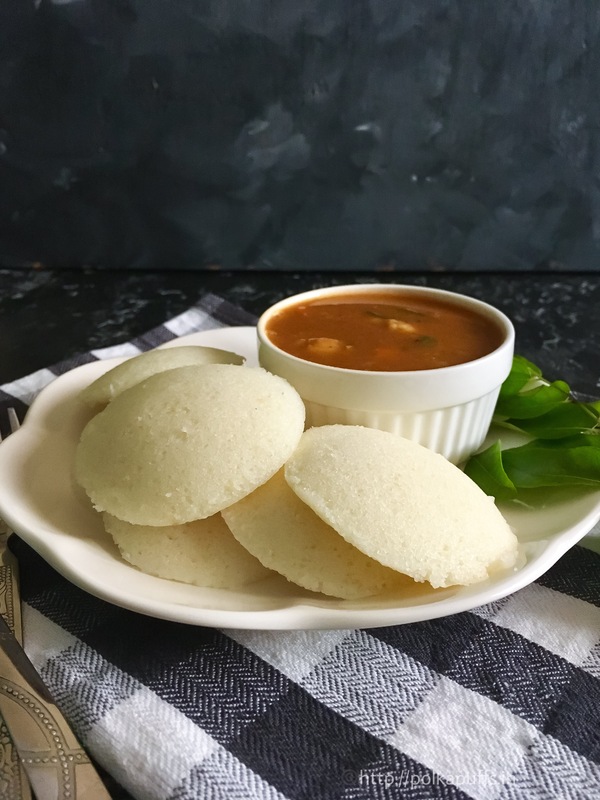 Idli Sambhar / Udupi Style Idli Sambhar – the evergreen breakfast in most homes is a novelty at mine! That’s because my hubby isn’t too fond of it and rarely agrees to have this combo for breakfast/ brunch. So on the day when he finally agrees to have some for the weekend, I go all out in making this combo extra special. 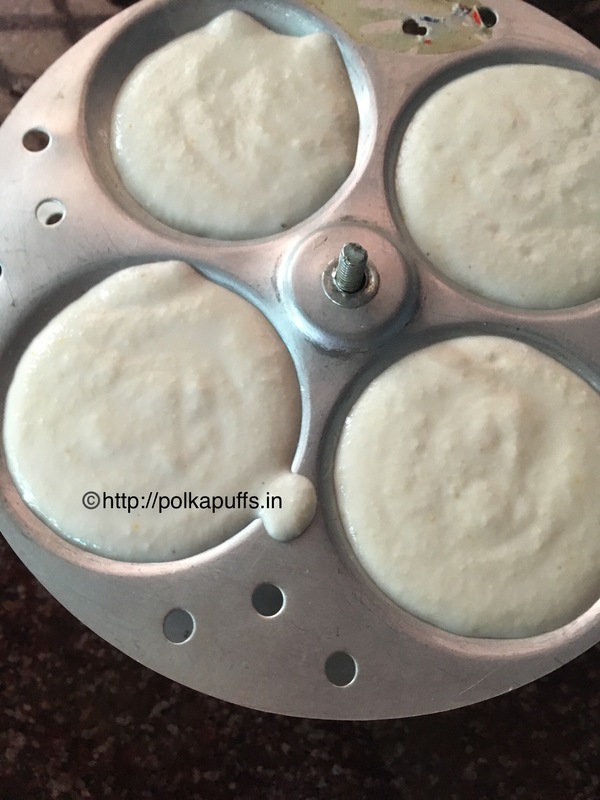 There are no tricks to making a perfect Idli (lentil cake) if you ask me….it’s the climate that plays the most important role. Warmer the climate, obviously, better the fermentation resulting in soft, moist & super spongy Idlis 😋 Besides, softer the Idlis, the more Sambhar (South Indian style spiced lentil curry) they soak up!!! Sluuurrppp! 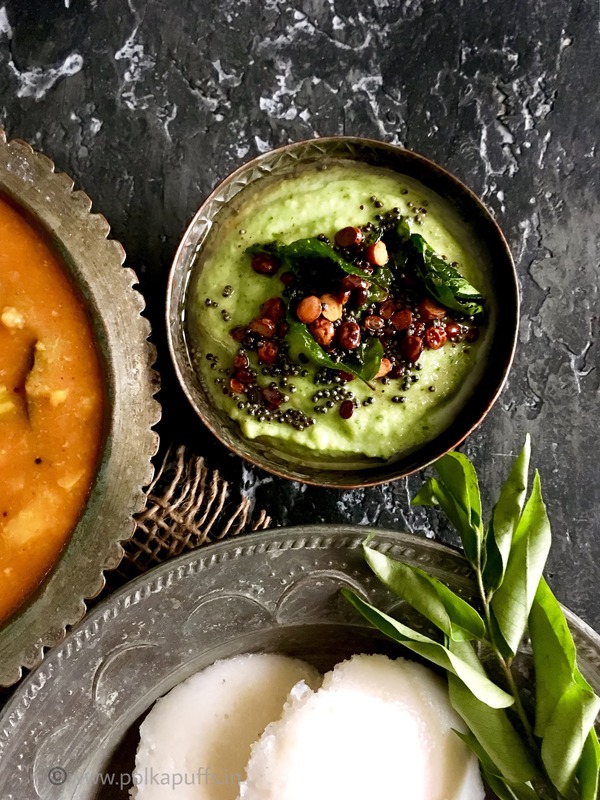 I have used my Mom’s recipe for both, Idli & Sambhar…along with her lip-smacking, easy-peasy green Coconut Chutney🤓 I must confess…this Sambhar is the closest to a traditional tiffin/ Udupi style Sambhar that I have ever had at home. Robust flavors accompanied by the tang from tamarind makes it super yum! 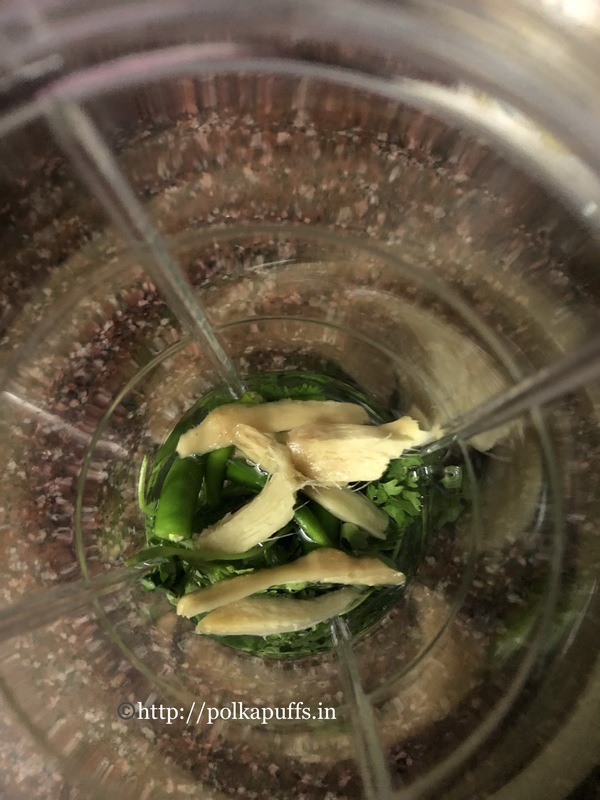 Let’s get going with the recipe…..I have shared a few tips in the method given below. We will start with the Idli. 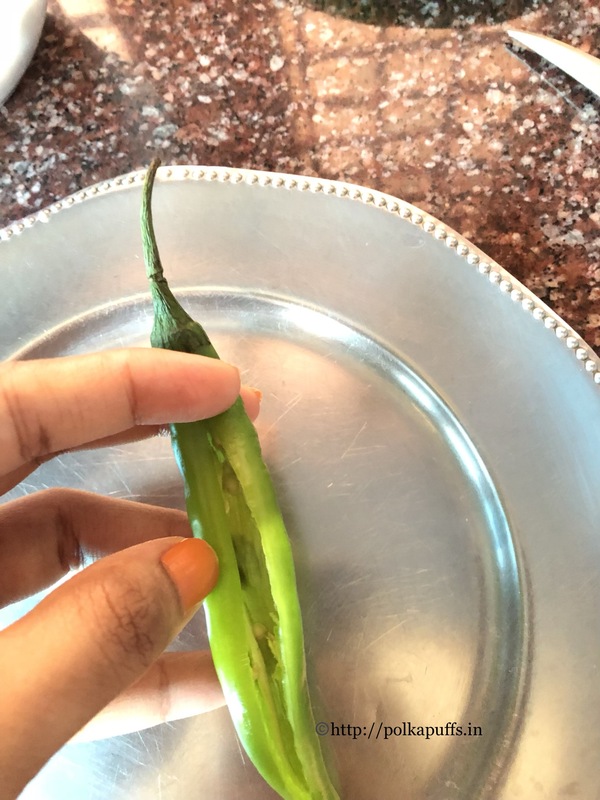 Wash the urad dal first. Rinse it at least twice under running water. Soak it with enough water for a minimum of 6-7 hours. Follow the same step for the two kinds of rice. Soak them together with enough water for a minimum of 6-7 hours. Also, add the methi when soaking the rice. Once the dal and the rice have soaked well, grind them separately. The dal, when ground must be smooth. Do not add too much water while grinding it. Follow the same step for grinding the soaked rice with methi. However, the texture of rice when ground will be slightly grainy. Do not add too much water while grinding them. Next, mix the ground dal and rice together in a large bowl. You can add a bit of water (I added approximately 1/2 cup) if they seem too thick after mixing. Do not add salt yet. Once these two are mixed well, cover the bowl with a lid and set it aside in a warm place to ferment overnight. Since the climate here is very hot & humid, the mixture fermented very well…almost overflowed from the bowl by next morning. You can place the bowl in the oven with its light on to ferment overnight if the climate in your part of the world isn’t very hot. Do not touch the mixture or disturb the process of fermentation. What I usually do is, soak the rice & dal in the morning around 11am, it’s soaked really well by 6pm. That’s when I grind & mix them. That way the mixture ferments for almost 12-13 hours for breakfast the next morning! It always works for me, I don’t add ENO or any other fruit salt to make the Idlis soft and spongy. The fermentation is the only key here. Now that the batter is ready…what remains is making the Idlis! Keep about 1 cup water in the Idli steamer/ pressure cooker to boil. In the meantime prepare the Idli plates, grease each depression with some oil. Season the batter with salt and mix well. Pour about 2-3 tbsp. of the batter in each greased depression. Steam these in the pressure cooker/ Idli steamer for 10-12 minutes. Once done, gently remove the Idli plate stand from the cooker/ steamer. Let it cool for a few minutes. Take a bowl of water. Use your butter knife. Dip the butter knife in the bowl of water. Then gently run it around the Idli and the Idli will come off the plate intact! Dip the butter knife in water for each Idli. Foolproof way to get those perfectly intact Idlis!! 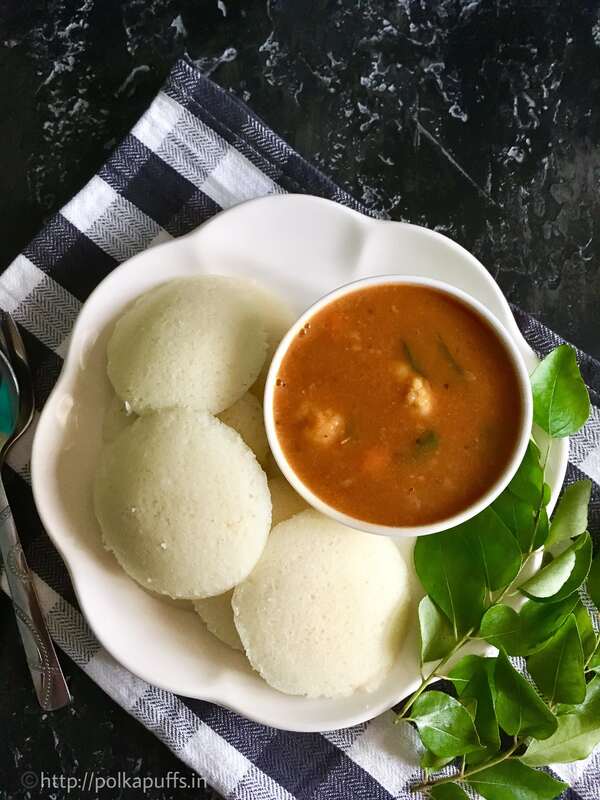 Idli Sambhar / Udupi Style Idli Sambhar - the evergreen breakfast in most homes is very easy to make and absolutely healthy! Since the climate here is very hot & humid, the mixture fermented very well...almost overflowed from the bowl by next morning. You can place the bowl in the oven with its light on to ferment overnight if the climate in your part of the world isn't very hot. Do not touch the mixture or disturb the process of fermentation. What I usually do is, soak the rice & dal in the morning around 11am, it's soaked really well by 6pm. That's when I grind & mix them. That way the mixture ferments for almost 12-13 hours for breakfast the next morning! 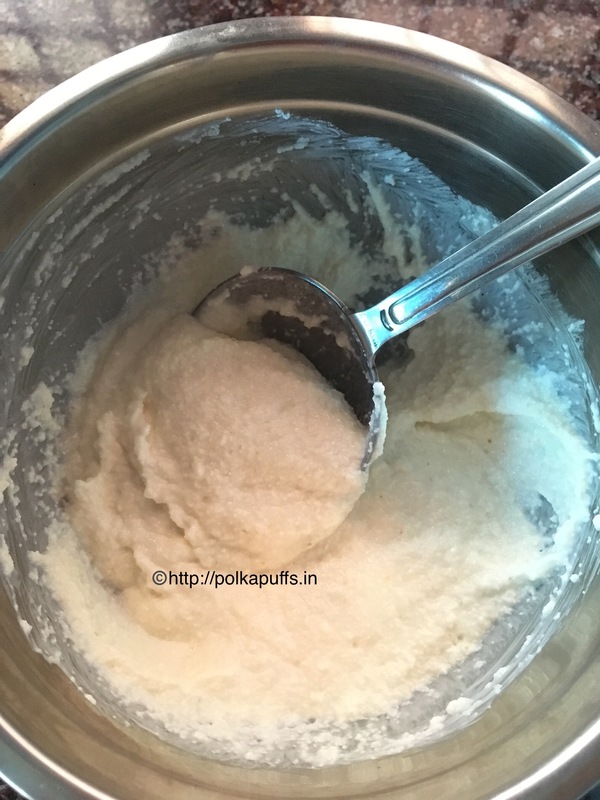 It always works for me, I don't add ENO or any other fruit salt to make the Idlis soft and spongy. Now that the batter is ready...what remains is making the Idlis! Keep about 1 cup water in the Idli steamer/ pressure cooker to boil. I simply love these….and the combo is to die for!! Do try once. Some things are so simple and yet never cease to amaze you!! Lemon Rice happens to be just that for me! It’s so full of flavour, refreshing in every bite…I can’t seem to get enough of this! Leftover rice means Lemon Rice!! I make it at least once every week if I have any leftover rice. Being a non rice eater couple, I make rice just once a week, a little extra to purposely save some for the next day 😁 Even as a kid, my Mother would make it for lunch sometimes, pairing it with some papad, curd, pickle, etc. I always temper it with loads of chana dal, peanuts and stuff to give a crunchy texture! 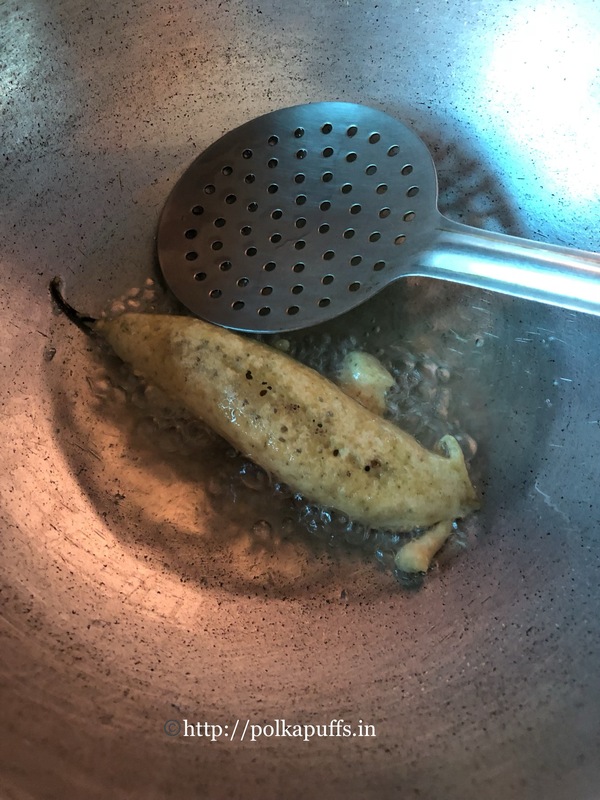 Equipment: measuring cups/ spoons, a wok. Heat oil in a wok. Once it’s hot enough, add asafoetida, curry leaves, mustard seeds, chana dal, urad dal, turmeric pwd, dried red chillies. Let these crackle for 2-3 mins. Next, pop in the peanuts. Fry the peanuts with the other ingredients for 5 mins. Season the ingredients with salt and add the cooked rice. Squeeze lemon juice and mix well. Turn off the flame. Cover with a lid for 2 mins and serve hot. *If using freshly cooked rice, then keep it the refrigerator for 30 mins before making Lemon Rice. *Always use a fork to fluff the rice before adding it to the wok. This keeps the cooked grains of rice intact. 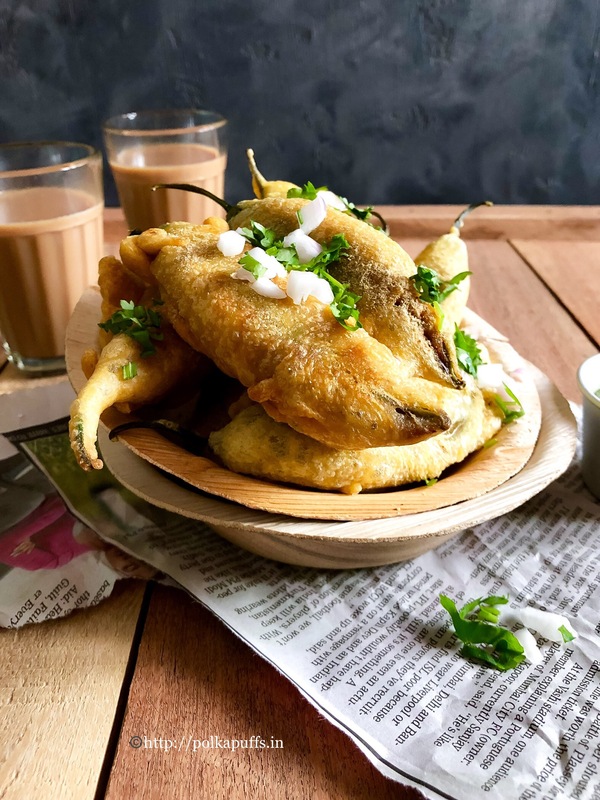 This a really common preparation in most homes…being instant & super easy to make..although, a few ingredients here and there & the proportions may vary…but the results are always mouthwatering! Here’s my take..
Take all the dry ingredients in the bowl, stir them well. Then add water and make a runny batter. Let it sit for 5-7 mins. It’s really simple… Gives you about a big bowlful. 1 freshly grated coconut, about 1 bunch of coriander leaves, 2-3 green chillies & some salt. Grind these with some water. Adjust the seasoning. You can temper it if you like..although I usually don’t do it! Done! This chutney stays fresh in the refrigerator for 3-4 days. Doesn’t that look absolutely tempting😬😉 they taste so good..